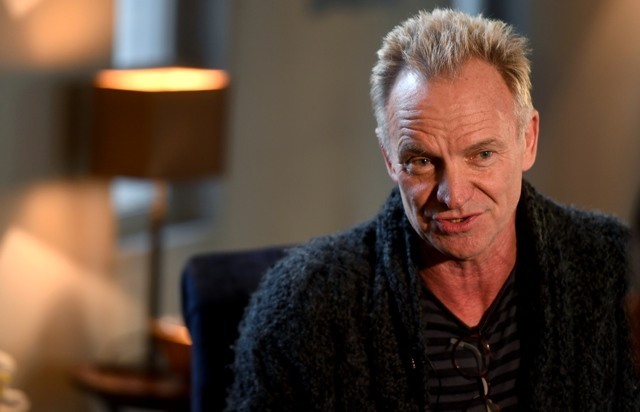 Grammy Award winner Sting may have albums, accolades and global tours to his name but when it came to writing his first theatre musical, the songwriter said it was "the most challenging, difficult and wonderful adventure" of his life. Born and bred in Tyne and Wear, the acclaimed singer has written The Last Ship about something he knows well - the demise of the Swan Hunter shipbuilding industry in Wallsend and its effect on a whole community. The musical premieres in the UK and Ireland this year, stopping off at Birmingham's New Alexandra Theatre from April 16 to 21 before continuing on to cities including Leeds, Cardiff, Dublin and Salford. You can tell from Sting's wistful manner and the way he hangs on some of the words, especially about his father, that there's plenty of personal emotion attached to these songs and the hard-hitting storyline of The Last Ship. There's original songs but the show was inspired by Sting's 1991 album, The Soul Cages. Set in the 1980's Thatcher era, it's a story about a sailor, Gideon Fletcher, returning home after 17 years at sea. He fled the town to avoid following his father into the shipbuilding business but returns to face a family now on the picket lines as the shipyard is closing, along with a childhood sweetheart that he left behind. Many of the songs are inspired by Sting's childhood in the North East. 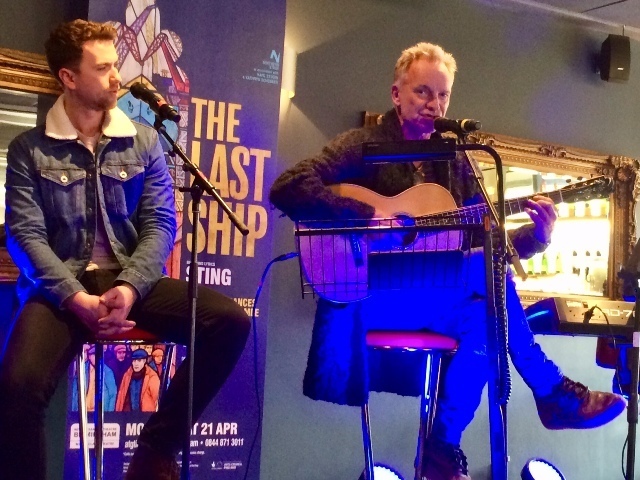 Sting, 66, who grew up as Gordon Sumner in Wallsend as the eldest of four children, recalls: "The Last Ship is a very personal story for me. I lived in spitting distance of the shipyard. My grandfather was a shipwright and as a kid I thought it would be my destiny or fate, but it was last thing I wanted." "I wanted to be a songwriter and sing my songs around the world and that's what happened to me and I made a great fortune," adds Sting proudly, pausing with a smile as his words remind everyone of his fame with rock band The Police along with further success as a solo artist. He continues: "But the ship yard fell on hard times and the town was destroyed. I felt I owed a debt to the people I was brought up with to tell their story." "There's a theme in there about a difficult relationship between a father and son - and I have the real estate on that," Sting mumbles meaningfully. "There's also universal themes about the closure of an industry where a town has an identity from the work it did." Given a preview of the original score, it's clear that The Last Ship is no jukebox musical with happy clappy songs. The soundtrack is distinctively Sting. There are gritty songs but with a soft, swaying folk element and poetic lyrics that bring out the North East lilt in the vocals. Songs like Dead Man's Boots (which Sting says reminds him so much of his "old man") and Sail Away have tuneful yet sorrowful sounds to them. Then there's the humorous and romantic The Night The Pugilist Learned How To Dance, while What Have We Got? is a foot-stomping rousing call to arms. These original songs feature alongside some of Sting's older tracks, Island of Souls, All This Time and When We Dance. 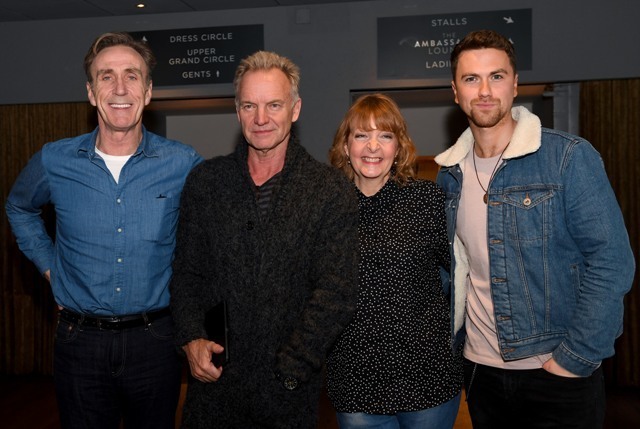 Sting with the cast of The Last Ship, left to right, Joe McGann, Charlie Hardwick and Richard Fleeshman. Sting plans to attend every opening night on the tour, which kicks off at a venue he knows only too well - Newcastle's The Northern Stage. "My first job as a professional musician was in the orchestra pit for Joseph when I was 20," chuckles Sting. "That was my first experience of theatre as a bass player and we'll be opening The Last Ship on the tour at that same theatre in Newcastle. So, I've gone from being the bass player to the gaffer." After eight years of work, Sting will finally see his creation performed in the UK following initial success in America when Jimmy Nail was the star of the show. There's a different cast this time around plus the script and songs have been altered for British audiences with a more political storyline and a few less strands than seen in the Broadway version. But the musical is an ever changing beast with Sting admitting that he hasn't finished with it yet and is constantly updating lyrics in the rehearsal room. "It could be a different show by the time it gets to Birmingham", he warns me. The other difference about writing a musical for Sting is not being on stage to perform his own songs, something that feels strange to him. He even compares it to "an out of body experience" when hearing others sing and interpret his songs, but he seems pretty happy with the cast's performances In rehearsals so far. That cast taking care of Sting's masterpieces include former Coronation Street actor Richard Fleeshman as the young hero Gideon. He's got a sweet, mellow voice that works well with Sting's song range. Then there's TV regular Joe McGann as Gideon's father, whose the dramatic heavyweight as foreman Jackie, a man struggling to keep the community and his family together. Interestingly, former Emmerdale actress Charlie Hardwick playing Gideon's mother Peggy knows only too well the hardships of Wallsend as it is where she grew up too, although she's quick to add that she didn't know Sting at the time. Charlie adds: "This is a very personal project for me as I grew up there and knew that skyline well. What feels great is having a rehearsal room full of 16 northern actors bringing their heart and soul into this show. Then there is Sting and you can feel him willing you on. He's written some of the songs with rhyming couplets that only work with the (North East) accent. He's a great poet and wordsmith." The Last Ship opens at The Northern Stage in Newcastle on March 12 before heading off on a UK and Ireland tour from April 9. A full list is below.